Often, the cover of a book doesn't quite tell the whole story (says the blogger who has a feature called “Judge A Book by its Cover"). The cover of LEGEND, by Marie Lu, unlike many of the covers adorning young adult books today, offers more of an insight into what the story brings. It is not cluttered, but what is there makes an impact. It is stark but memorable, and in its own way, it is beautiful. In a year chock-full of wonderful dystopians, Legend manages to stand out in its own unique way. The strength of Legend comes from its characters. Too often in new dystopians, the characters, especially the supporting characters are neglected in favor of the excitement of the action and twists and turns of plot. In Legend, both Day and June were fully fleshed out, and every character was three-dimensional. They were people, rather than background introduced in order to fill in the space between point A and point B. Even Metias, who is murdered near the beginning of the book (that's not a spoiler; it's in the summary), is a fully fleshed out character. In fact, not only would both Day and June pass Small Review's incredibly useful (what would main character do) test with flying colors, Metias would pass the test. Thomas, Metias's best friend and June's friend and protector, would pass. Tess, the girl who scavenges the streets with Day, would pass. I felt like I knew every character. The story has plenty of action, but it is not overly action-packed. Marie Lu did an excellent job of balancing the different parts of the story. I loved the swtiching points of view between Day and June. In the beginning, each is so convinced of the other's villainy, and each thinks he or she is in the right. And as the story develops, it is clear that they are both true heroes, and they are able to discover the other's heroism. Each character's chapters have their own font and color, so there is never a chance of confusion. Even without the coloring and font, there is little chance of confusion, as each character has their own unique voice. And each character has their own perspective on the story, so the reader gets to experience two sides of the same story, with all the biases and experiences that each character brings to it, up until the end, when they realize they're on the same side. One of the ways Legend stood out from the rest was the path it chose to take regarding plot. Many dystopians out there repeat the same themes and plot points. Legend did not stick to the traditional path of dystopians. It had an original and intriguing plot, and I never quite knew what was going to happen next. Another unique feature was the Legend actually used the setting of once-America as part of the story rather than just using it as a place to put the story. I really appreciated the way Marie Lu incorporated the history we know about rather than purely making up her own, with no knowledge from before the big whatever that destroyed civilization as we knew it. 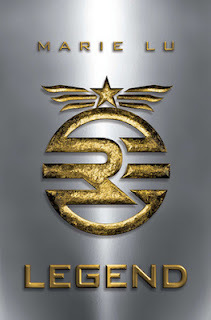 Although part of a trilogy, Legend works (really well!) as a standalone. I actually didn't know it was part of a trilogy until after I finished it. The ending is not a cliffhanger, but will leave you begging for more because the story was just so good. One of the best dystopians out there. Highly recommended.